Understanding isochrones for public transport is very complex, but we guarantee that the result is really precise, and the user can effectively analyze the public transport network. You will be able to view the urban areas reachability departing from a precise date/time; a 5 minutes delay could produce a very different result. We have downloded and processed the GTFS files from http://transitfeeds.com/ website. You can ask for 10 minutes isochrones without registration. If you wish to view isochrones with different times (between 5 and 60 minutes) registration is required. You can ask to set-up your preferred city providing us the GTFS files. If the GTFS files is a public domain file we can use it. In addition we can manage more than one GTFS file version for the same city, so you can view the difference between the reachable areas. This option is very useful when you have to understand what happens when you change/add/remove a route or change its timetable. 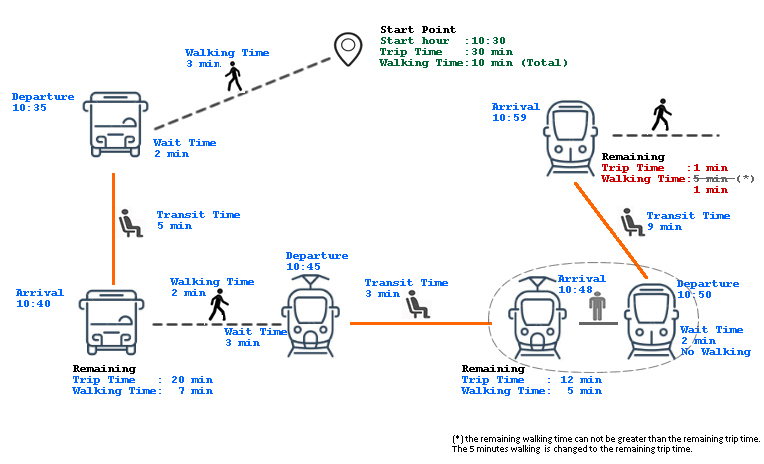 The Trip Time is the total time for your trip, this time includes time lost in walking between stops and waiting plus the transit time. The Walking Time is the maximum time you want to spend on walking during the trip. The Walking Time must be less than the Trip Time and when you get off the public transportation, the remaining walking time can not be greater than the remaining trip time. Total: this is the total walking time for the whole trip. When you reach a stop on foot, the time spent goes to decrease the total walking time. Each stop: this is the walking time always available for each stop. Copyright © 2016 K-SOL S.r.l.